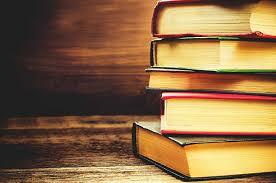 Have you ever read a book where you were consistently confused about what is real and what isn’t? I felt that way all through JP Delaney’s newest book, Believe Me. Just when I thought I knew what was going on, a twist would come from out of nowhere and I would be back at square one, trying to figure out what was happening. Believe Me by JP Delaney tells the story of a young actress desperate for money. Claire is a struggling British actress who, through a series of nasty circumstances, finds herself living in New York without a green card. Not sure what else to do and needing money and a job, Claire becomes resourceful in order to find work. Since she is an actress, Claire eventually finds employ working as a decoy for a firm of divorce lawyers. Her job is simple: she has been hired to entrap straying husbands. She is to get close, but not too close, in order for him to proposition her, while she stays slightly aloof. The firm needs evidence of their straying, but they must not be coerced. Claire’s newest job seems straight-forward: the client warns her to be careful and is insistent that Claire doesn’t fall for any of her husband’s tricks. Claire’s meeting with the client’s husband hadn’t gone as well as she had hoped which frustrated them all. Moving on, Claire is surprised when that wife ends up violently murdered and the cops are convinced that the husband is to blame. The cops decide to take advantage of Claire’s lack of a green card and her prior association with the suspect. They entreat Claire to use her acting skills and her work as a decoy to hopefully lure the husband unto a confession. This seems like an easy job to Claire. After all, she is paid to lure men into propositioning her. How hard could it be to lure a man into confessing? Claire takes on a new identity and voice that the police feel will catch the killer’s eye. The closer she gets to the target though, the more Claire wonders if she is actually the decoy or the prey. Is she the hunter or the one being hunted? The further she gets into the investigation, the more questions are raised. The twist at the end of this novel hit me so hard that 1) I audibly gasped and drew the attention of everyone in the grocery store around me and 2) I had to rewind and listen to the ending multiple times before I fully understand what was going on. I love when books do this to me. Read this book and let me know what you think! 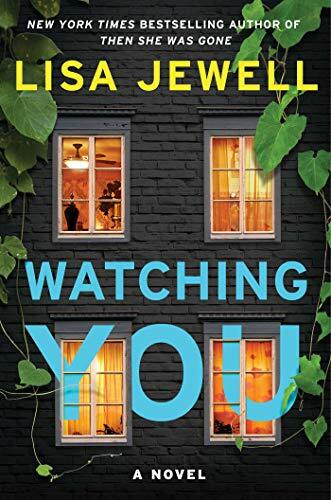 I am a huge fan of mystery and psychological thrillers and Watching You by Lisa Jewell is a fabulous addition to the genre. The twists and turns in this thriller will keep you guessing until literally the last paragraph. The book begins with a murder in an affluent English town but the reader does not know the who, what, when, where or how. With an opening such as this, the tension grows and every character’s motivations are suspect until the true killer is revealed. Newlyweds Joey Mullen and her husband Alfie have just moved to the exclusive neighborhood of Melville Heights in Bristol, England. Unable to afford rent on their own, they take up residence with Joey’s brother and sister-in-law. As a newcomer in the neighborhood, Joey befriends Tom Fitzwilliam, the beloved local school headmaster who lives two doors away and her initial friendship turns quickly from infatuation to obsession. But, unbeknownst to Joey, someone is watching through their photographic lens. It is Tom’s teenage son, Freddie, who documents the goings on in Melville Heights and sees the blossoming relationship his dad is starting with Joey. But Joey isn’t the only person in this neighborhood who is obsessed with Tom Fitzwilliam. Bess, a young student at the school, is observed slipping in and out of the headmaster’s office by Jenna, another teen in the neighborhood and the speculation grows. Does Tom have secrets to hide? To add to the intrigue Jenna’s mother is convinced a group of neighbors, headed by Fitzwilliam, is stalking her. Young Freddie and Jenna join forces and with their prying eyes discover a decades old suicide which will bring motivations for murder to light. Everyone has a reason, but who is willing to kill in order to keep a secret and enact revenge? About half way throughout the book I thought I knew the ending, but I was completely shocked at the culprit and the twisted motivations behind the killing. I highly recommend Watching You for suspense and thriller fans! I am a sucker for a good thriller with a mystery twist. I stumbled upon Something in the Water by Catherine Steadman while looking for a new book to listen to over the holidays. The light blue cover with the shock of red instantly made me think of murder. Even though covers sometimes don’t relate to the content of the book (which is a topic for another time), I was ready to give this book a try. Imagine my pleasant surprise when the cover actually related! Win! 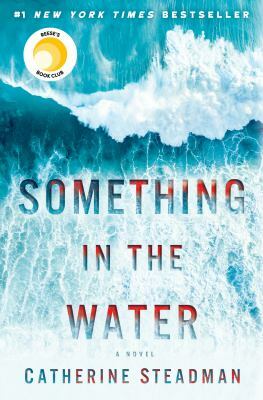 Something in the Water by Catherine Steadman is the story of a married couple thrust into a troublesome situation with differing views of how to handle it. Erin and Mark are a lovely couple. Living in England and passionately in love, they live a bit of a charmed life, hardly lacking for anything. Erin works as a documentary filmmaker on the brink of a professional breakthrough. Working her contacts, she is in the midst of filming a documentary following three people in prison. Promising to discuss their arrests, talk to them while they are in prison, and then follow up with all three after they are released, this documentary has the potential to shoot Erin to the top of desired filmmakers when it’s finished. Mark is a investment banker with big plans for their life together who seems to bankroll Erin’s dreams. While in the midst of wedding planning, Mark is let go from his job. Since Mark brings in the bulk of the money, Erin and Mark are forced to tweak their wedding plans. They decide to honeymoon in Bora Bora, a dream honeymoon in the tropics. Jetting off to Bora Bora, Mark and Erin are ready for two weeks of relaxation in the sun and sand with just each other, exactly what they need after the stress of Mark’s dismissal. A few years ago, Erin had a bad scuba diving experience. Despite this, she agrees to go scuba diving with Mark, since it is something he really enjoys doing. While scuba diving after a major storm, they find something in the water. Erin understandably freaks out, leaving Mark to investigate on his own. What he finds isn’t good and leads the two down a dangerous path. Just when they think they have left that event in their past, Mark finds something else connected to what they found in the water. After trying to get their resort involved, Mark and Erin realize that they must decide whether to speak out even more or to keep everything they found a secret. What would you do if you found something that had the power to drastically change your life circumstances? If no one else knew you found something, what would be the harm in keeping it? Whatever they decide will lead them down a life-altering series of events that has the possibility to destroy their comfortable lives forever. This book is also a Reese Witherspoon Book Club pick from 2018, so you know it’s a good one. Get to reading (or listening) and let me know what you think! What would you do if you were stuck in a remote lodge in the middle of winter for a long weekend? This lodge has hiking trails, a library, fireplaces, and other outside activities. Sounds pretty idyllic, right? I thought so! 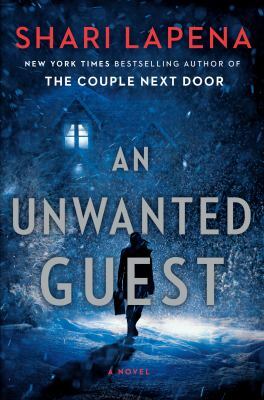 Author Shari Lapena takes every bookworm’s dream weekend getaway and turns it into a nightmare in her newest novel, An Unwanted Guest. Fans of murder mysteries will want to read this book as Lapena crafts a book with descriptions similar to an Agatha Christie novel. An Unwanted Guest by Shari Lapena tells the story of a group of people headed to a cozy mountain lodge named Mitchell’s Inn in the Catskills for a perfect weekend retreat. Things start to turn dicey on the drive to the lodge as a winter storm starts to barrel down on the area. Once everyone is settled at the lodge, they all settle in for various romantic, relaxing weekend activities. As events unfold, it becomes obvious that each person is not what they seem. When planned activities come to a screeching halt as the weather increasingly becomes worse and worse, the guests are forced to rely on each other for companionship. As more and more guests arrive at the inn, they greet each other with interest, wondering about their reasonings for being there, but not wanting to get involved. The weather keeps guests and limited hotel staff stuck inside the Mitchell Inn without any hope of rescue from the outside. Waking up to a horrifying scream the next day, guests discover a dead body laying at the foot of the stairs. As the weekend progresses, the situation further deteriorates out of control with a frightening new truth coming to light. There’s a killer in their midst. None of them can escape. There is nowhere to run. They’re trapped, desperate for help, and finding that their trust in others is quickly slipping away. Searching for the truth, tensions run high as they all try to find out who is the killer and, most importantly, stay alive! I recently stumbled upon author J.T. Ellison while looking for a new book to read on OverDrive. I had heard of Ellison in the past, but had never read anything she had written before. 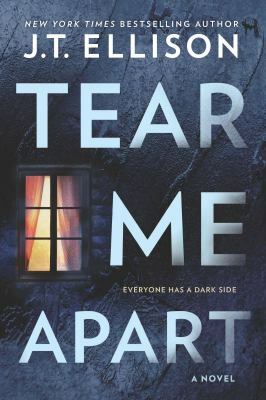 The description of her most recent standalone novel Tear Me Apart captured my interest because the description of the book seemed pretty straight-forward, but once I started reading, I realized that this book was going to be anything but straight-forward. Tear Me Apart by J.T. Ellison tackles the question of how far a parent is willing to go to save the life of a child. Mindy Wright is a competitive skier at the top of her field. Despite being only a teenager, Mindy has a great chance of making the Olympic team. Competing on a course she is very familiar with, Mindy is sure she will win her current race. The weather is getting progressively worse, yet race leaders haven’t decided to halt Mindy’s run. Mindy’s life is derailed after she suffers a catastrophic downhill crash. Her leg is broken and she is rushed to surgery. In surgery, doctors discover a complication: Mindy is suffering from a severe form of leukemia. On top of recovering from surgery, Mindy must undergo treatment for leukemia. With her condition worsening, the doctors realize that a stem cell transplant is her only hope. Mindy’s parents and her aunt are tested to see if they’re a match. When the results come back, they are all stunned to see that Mindy is not biologically related to any of them. Mindy’s aunt works for the Colorado Bureau of Investigation in the lab and does some looking into the DNA in the case. How could Mindy not be related to any of them? In the race to save Mindy, multiple lies and secrets are uncovered stemming back to before Mindy was even born. As her aunt tries to figure out a way to save her, readers are left to wonder if Mindy was switched at birth or if a more disquieting plot unraveled at the time of her birth. What is her mother keeping secret? Why is she holding back and seeming to change her story so often? One look at her face and others around her start to doubt the validity of her claims. As the search for Mindy’s truth progresses, the secrets revealed and the tension created begin to tear the family apart and put everyone on edge. Certain members of the family are willing to do whatever it takes to protect their secrets. With Mindy’s fame as a skier, the press becomes involved when a statement is released pleading for help to find a match and to hopefully keep the rumors at bay. How far would you go to save a child? To keep your secrets hidden? This novel digs deep into the hidden links, layers, betrayals, and secrets that have served to bind two separate families together over many, many years. Would you fight to keep the darkness and secrets buried even when the truth could potentially save someone? What about if those secrets could break apart your entire world? How long would it take you to thoroughly believe the web of lies you created for yourself and your family? Would you forget your real identity and the lives of the ones around you? Ellison weaves a gloriously tangled suspenseful thriller of a novel that will have you wondering if the people you see on a daily basis are really telling you the truth. B.A. Paris has yet to disappoint me with her novels. Since her first was published in 2016, I’ve been a devoted reader. I know when I pick up her books that I will be transported to a dark, twisty world where I’ll be gripped by thrilling escapades of all characters presented. 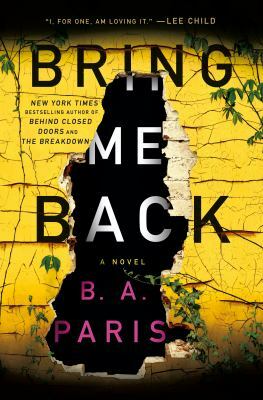 Her latest, Bring Me Back, drops readers right in the middle of a mystery and doesn’t solve it until the very end. Bring Me Back by B.A. Paris tells the tale of a complicated and mysterious love. Finn and Layla are madly in love and on vacation. On their way back, Finn stops at a rest stop to go to the bathroom. Layla stays in the car, wanting to wait to use the restroom until they stop at a well lit service station instead. When Finn returns to the car, Layla is nowhere in sight. Not thinking much of it, Finn pulls the car closer to the restrooms waiting for Layla to come out. She never does. She’s disappeared without a trace. The above is the story that Finn told the police, but it’s not the whole story. Flash forward twelve years. Layla is still missing. Finn has moved on. He’s now in a relationship with Layla’s sister, Ellen. In fact, they’re now engaged! This relationship has garnered them negative attention in the media, but thankfully most of it seems to have died down. Bonded over their shared grief over Layla’s disappearance, both Ellen and Finn have settled into a routine in a place where they are no longer seen as relatives of the missing woman. Everything is working out. No it’s not. That’s not the whole truth either. Not long before Finn and Ellen are to be married, the policeman who worked Layla’s disappearance phones Finn with some startling news: their old neighbor swears he saw Layla standing outside their old house, but she ran away before he could check for sure. Chalking that sighting up to the witness’s old age and diminished eyesight, Finn moves on with his life. Other strange things keep happening though that seemed designed to test Finn and Ellen’s relationship and maybe tear them apart. Emails from strangers who know intimate details of Finn and Layla’s life together. Lost items from Ellen and Layla’s past suddenly appearing out of nowhere. Messages sent through the mail, strange gifts showing up around town, and clues to Layla’s disappearance keep popping up. Finn finds himself wondering if Layla is back. Is she behind these strange happenings? What does she know? What does she want? How far is she willing to go to get back what she believes is hers? I found myself constantly guessing about the strange person behind the gifts and their motive for harassing a seemingly normal couple. Readers will be questioning everything and everyone they thought they knew throughout this novel. I stumbled upon The Innocent Wife by Amy Lloyd when scrolling through RiverShare OverDrive looking for my next read. I spend a lot of time commuting for both my work and my fiancé’s job. Having books easily accessible whenever I need them is one of the major reasons that I use the RiverShare OverDrive app available through the Library. (It sure beats having to haul a backpack full of books when a weekend work trip for my partner pops up at the last minute!) Anyway, I found The Innocent Wife on our last road trip and decided to give it a try. 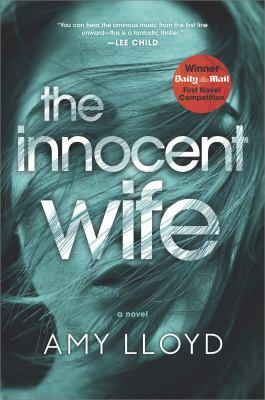 The Innocent Wife by Amy Lloyd tells of the burgeoning love between Samantha and Dennis. Their love isn’t all sunshine, rainbows, and flowers though, as readers are quick to realize. Samantha lives in England and spends her time outside of work obsessing over the case of Dennis Danson. Dennis is a prison inmate who, over twenty years ago, was arrested and thusly imprisoned for the brutal murder of a young girl in Florida. Dennis’ case is full of mysteries as it comes out that multiple other girls disappeared in the same area around the same time. No one was ever arrested for those disappearances though, nor where any of the missing girls’ bodies found. Many residents of the area believe that Dennis abducted and killed the girls, but that police only had enough evidence to convict him of the murder that landed him in prison. Dennis is now the subject of a true-crime documentary that has succeeded in grasping the attention of the national media and social media. People online and in person have come to believe that Dennis was wrongly convicted and that they are the only ones who can uncover the truth. Samantha finds herself on these message boards and reaches out to Dennis to talk to him about his case. As the two communicate through letters, Samantha quickly finds herself wooed by his charm and kindness towards her. Uprooting her entire life, Samantha decides to travel to Florida, meet Dennis in person, and begin campaigning for his release. As soon as Samantha steps out into the balmy Florida heat, she begins to feel uneasy. She continuously pushes her feelings to the back burner in order to put Dennis and the campaign for his release first. After all, everyone would have cold feet meeting someone in person for the first time, right? That would be awkward for anyone. Nevertheless Samantha decides to marry Dennis(NOT A SPOILER, GUYS! It’s called The Innocent Wife after all…). After they are married, major developments happen in Dennis’ case and Samantha is forced to face some uncomfortable realizations about both Dennis and herself. Her confidence in Dennis’ innocence begins to waver, but with the intense media scrutiny and their marriage, she still feels the need to stick by him. Samantha doesn’t know Dennis as well as she thought she did despite her initial unwavering support of his innocence. The more time she spends with Dennis, the more she realizes that she might not want to know the real truth about his past. Give this book a read and let me know what you think. I had complicated feelings toward Samantha as a main character that almost made me want to read something else. There are also several other characters that both intrigued and slightly appalled me. I’m curious about your opinions. 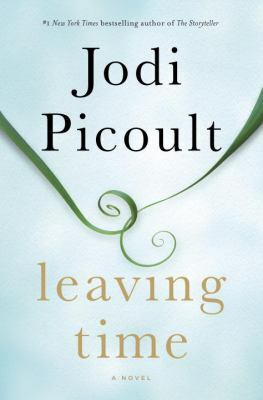 Leaving Time by Jodi Picoult tells the story of lost souls trying to find their place in the world. Alice Metcalf grew up knowing that she wanted to study elephants. They always fascinated her. Traveling to Africa to study them, Alice, upon watching the elephants’ behavior, decided to focus her scientific research on how elephants grieve. Alice’s life changed drastically when Thomas Metcalf walked into her life. She soon found herself becoming a mother and wife. Balancing those two new roles with her scientific research and helping Thomas run his elephant sanctuary in New Hampshire quickly became difficult to do. She struggled balancing all of her desires and found herself in a sticky situation she could not easily see a solution to. Alice was a beloved researcher, wife, and mother, but it’s been over a decade since anyone has seen her. Alice disappeared under mysterious circumstances more than ten years ago and left behind her husband, small daughter, and all the elephants that she had become especially attached to. Alice’s daughter, Jenna, has grown up into a thirteen year old who lives with her grandmother since her father has gone mad with grief and is locked up in a facility. With her father never seeming to recognize her and her grandmother refusing to even discuss her mother, Jenna refuses to believe that her mother just up and abandoned her. Something horrible must have happened to Alice because the opposite, that she chose to abandon Jenna and start a new life, is unthinkable. Jenna decides that she must do more to find her mother. Jenna finds herself on the doorstep of Serenity Jones, a psychic with a legitimate gift who fell from grace and has not had contact with any actual spirits or ghosts in years. 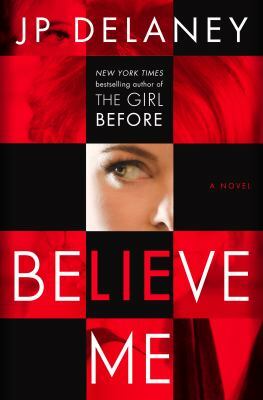 After contacting Serenity, Jenna searches out Virgil Stanhope, the detective who first worked her mother’s disappearance and the unfortunate accidental death of one of her mother’s coworkers. The night her mother disappeared was a mess and nothing seemed to be handled correctly. Jenna figures that Virgil must know more about Alice’s disappearance. If not, Virgil surely botched her mother’s disappearance and he owes Jenna the opportunity to find her mother. He has to help. Both Serenity and Virgil soon find themselves wrapped up in the web of Jenna’s grief, anger, frustration, and hopefulness that her mother will soon be found. Jenna, Serenity, and Virgil all seem to be wandering around lost until they are in each other’s company when things finally start falling into place. This book is full of twists and turns. The twist at the end totally caught me off guard and 12 hours after finishing it, I still find myself trying to figure out how I never figured out the ending. This book is a beautiful piece of fiction. Picoult once again has written a deeply moving book that examines how the love between mothers and daughters defines one’s entire life. Agatha Christie was my favorite mystery author growing up, thanks to my grandmother who consistently bought me her books and watched her ‘Marple’ and ‘Poirot’ series on television. The classic whodunit mystery holds a special place in my heart. As a result, I have turned into a picky mystery reader. A mystery novel has to grab my interest quickly, sustain it through the end, and be complex enough that I am unable to predict whodunit. Enter in Anthony Horowitz’s Magpie Murders and I felt like I was back at my grandma’s watching Poirot solve a crime. This book felt like a delicious dive into my childhood. Magpie Murders is a book within a book, a mystery within a mystery, a murder within a murder. Susan Ryeland is the editor of Alan Conway’s mystery series featuring detective Atticus Pund. This book opens with Ryeland receiving a copy of Conway’s latest book, Magpie Murders, and her decision to read it over the weekend. Such begins the first foray into the book within the book. Conway’s Magpie Murders is the classic whodunit that takes place in the English countryside in a small village in 1955 where a well-known woman has died. Atticus Pund, a German concentration camp survivor who has become famous for his sleuthing skills, decides to head to the small village of Saxby-on-Avon to try to solve this Agatha-Christie like puzzle. A housekeeper named Mary Blakiston fell down a flight of stairs at Pye Hall. Her death had been ruled accidental, but the fiancée of Mary’s estranged son seeks Pund and asks for his help. There are many questions that Pund must answer and after a second crime occurs, Pund decides to visit on his own accord and figure out what exactly is happening in Saxby-on-Avon. Flash to the present when Susan Ryeland has reached the end of the Magpie Murders manuscript only to discover that the last chapter is missing. Confronting her boss, Charlie Clover, about the missing chapters, both Clover and Ryeland are surprised to learn that the author, Alan Conway, has committed suicide. Conway mailed a letter to Clover before his death explaining why he decided to commit suicide. After reading the letter, Susan decides to look for Conway’s last chapter and sets off interviewing his family and friends to find it and to learn more about Conway’s motives for killing himself. That last chapter will save Magpie Murders and hopefully Susan’s business as the death of Conway will certainly sink the company if that last chapter is never found. As she searches, Susan comes to believe that maybe Conway didn’t kill himself. She soon finds herself becoming sort of a detective as she tries to figure out what exactly happened to Alan Conway. I really enjoyed this book. Atticus Pund’s story was entertaining enough, but the addition of Susan’s story adds a delightful twist to the whole book. I was thoroughly entertained from beginning to end in both stories. 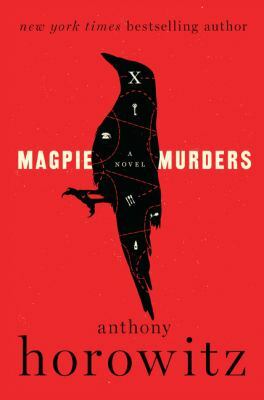 I also enjoyed how the stories intertwined together and how Susan was able to rely on the Magpie Murders manuscript to help her figure out what happened to Conway. There were so many tiny clues and revelations hidden in both Pund’s and Susan’s story that had me on the edge of the seat wondering whodunit. That eerie rhyme is something most kids learn in middle school when they first hear about Lizzie Borden. I picked it up on the playground as part of a jump-rope rhyme and the murderous story of Lizzie Borden has stuck with me ever since. I find myself reading and watching anything to do with Lizzie Borden in an effort to learn more about what happened the fateful day of August 4, 1892 when Andrew and Abby Borden were both axe-murdered in their home in Fall River, Massachusetts. Who did it? No one will ever know, but everyone has their theories. 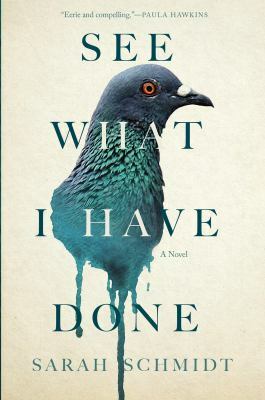 See What I Have Done by Sarah Schmidt is the most recent telling that I found. It was so engaging that I finished this book over a long weekend, something that I haven’t done in a couple years. This novel was surprisingly close to the truth with the author taking a few creative licenses. Schmidt takes the infamous true story of Lizzie Borden and adds some fictional material that fills in holes in Lizzie’s story as well as some fictional background information that is missing in the historical overview. All in all, Schmidt creates a remarkably believable account of what happened that steamy August morning when Andrew and Abby were murdered. This novel shifts between four main characters’ points of view: Lizzie, her sister Emma, the housemaid Bridget, and a stranger named Benjamin. Seeing each characters’ viewpoint of events leading up to the murders, the day of the murders, and after the murders allows readers to gain a multi-layered view of what really happened. The morning of August 4, 1892 began like any other morning in the Borden household: Mr. Borden, aka Andrew, went off to work, while Lizzie, Mrs. Abby Borden, and Bridget worked on tasks around the house. There had been a sickness around the house the last few days which led Abby to believe that she and the others were being poisoned. Lizzie was fine however. Emma, Lizzie’s sister, was out of town visiting a friend. Both sisters were unmarried and lived with their father and step-mother despite their parents’ repeated attempts to marry them off. The brutal axe-murder of both Andrew and Abby left the community wondering why anyone would want to murder such well-respected members of Fall River. Life inside the Borden household was not a pleasant experience though. Both Lizzie and Emma struggled to break free of their father and gain independence, but found that they were bound together in the most intimate of ways. Emma, Lizzie, Bridget, and the mysterious Benjamin all add overlapping perspectives to the moments leading up to the discovery of the bodies, perspectives that will jar readers and have them wondering what ghosts each person has living in their pasts and how those ghosts influence their current actions. What I liked about this book is readers can really see Lizzie progress to become the person that she was when her father and step-mother died. The true motive for why she started disliking her step-mother after loving her for so many years will never be known and Schmidt leaves that gap for the reader to try to solve. Something clearly happened to Lizzie that caused that great shift in temperament and demeanor. It was puzzling. I also enjoyed the multiple points of view present in this book because it allowed me to see the multiple layers that go into making a person and how one’s actions can mean different things to different people. I really enjoyed this book and think that it made a positive addition to the many Lizzie Borden books that I have already read. If you don’t know the true story of Lizzie Borden and her family, I encourage you to look it up in order to learn everything that is known about the family and how Schmidt’s reimagining lines up with the facts. She is fairly accurate and presents plausible explanations for both the holes in Lizzie’s story and the empty background information in most historic accounts. This book is also available in large print. Bad Behavior has blocked 2011 access attempts in the last 7 days.